Health Fair Connections | How does HFC make money? We want to make sure we have a free option for vendors that do not have the marketing budget, yet can still provide a great booth at your health fair. Not to mention, we would never charge the vendors you already have a relationship, but want to invite/add to your online vendor registration list. 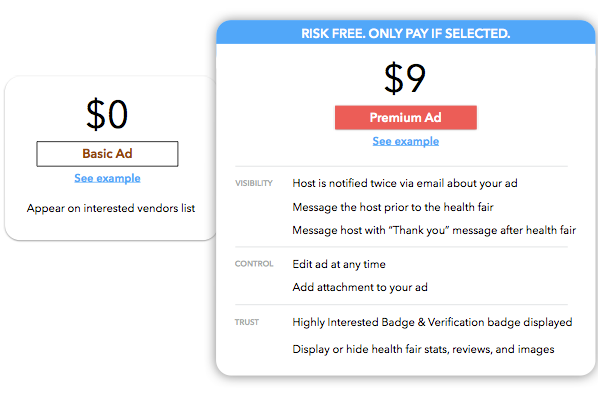 You can see below the two options (and the benefits of both) presented to the vendors when joining the list of interested vendors for a particular health fair. Honestly, Health Fair Connections (HFC) doesn’t make much money per health fair (on average, $12.55 per vendor). Not to mention, if you never select the vendor(s) who selected a premium ad, they are never charged - it's risk-free for all parties. We sacrifice charging HR managers and benefits professionals to use HFC as well as nearly 80% of our vendor community pays nothing. This allows all folks interacting on the platform to have an enjoyable experience, as cost doesn't get in the way! I hope this provided some clarification.